Good morning! 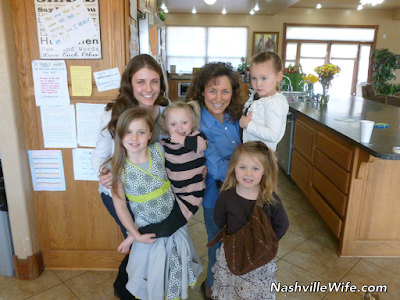 For those of you who are interested in reading the story of how we started blogging about the Duggar and Bates families, check out Ellie's latest post on NashvilleWife.com. I'm sure many are checking this blog hourly like I am LOL I have a feeling baby Seewald has arrived and that there is a delay in us knowing until there is permission to announce it? i thought the same thing! I have been checking the blog around the clock with no luck. Hopefully there will be some word soon!! Lol yeah that is what I have been doing! Are you guys going to blog about Jessa's delivery and has she had she baby yet? Love the blog by the way! Thank you for writing this blog. I am a huge fan of the Duggars and Bates. This is the only way to keep up with them that I can trust as the truth. Hope the baby is born the 4th like Jessa. I check it frequently. I missed guessing the birth date. Eager to see if I guessed the gender or weight correctly. I know your husband is Mr. Handsome and let me tell you you are Ms. Pretty! You look like someone I have seen on those teen magazines. You could definitely be a model. What a beautiful couple you two make together. I want to thank you for all the dedication you put into this blog. I know this is the one place I can read about the Duggars and not have to worry if the information is true or gossip. Thank you. You do an amazing job!! Could you please update us about how Joseph is doing in college (which courses is he taking, when will he get his degree, how is he feeling about being away from his family...)? We want to know more about the other Duggars, too!